There always seems to be something. A struggle that we cannot overcome. A fear that continues to paralyze us. A battle that we just cannot win. Like a game of tug-o-war, we often feel like we are winning and then – “Yank!” – we get pulled back in to a place of defeat. For me that place was filled with anxiety and insecurity. Oh, but I seemed to cover it up nicely with my fabricated illusion of control. The funny thing is that I never would have considered myself a person who struggled with anxiety, until that day I found myself sitting in the doctor’s office, convinced that I was having a heart attack or something because my entire left arm was tingling, and she says the words to me, “You are having a panic attack.” I looked at her like surely she was mistaken. I was thinking, “I don’t have anything to panic about!” And that is the moment my walls began to crumble. You see, about two years prior I felt like I was at the top of my game. I was just about to turn 40, had completed a fitness challenge (fit before 40, right? ), I was checking off my Bible Study to-do list every day and I had surrounded myself with people I wanted to be like. Are you sensing any red flags yet? I wasn’t. And it was then that the pain started. I don’t have enough space here to detail the following 3+ years here but the short of it is I now deal with chronic pain to varying degrees. Numerous MRIs, physical therapists, orthopedics and chiropractors led to inconclusive findings and no clear diagnosis. I am now just like millions of other Americans who struggle with low-back pain. So, why did I feel so alone? I wrestled with this for months. Little by little the Lord drew me closer and closer, stripping away everything that I placed my security in. He gently showed me that I was not surrendered to the Him in the way I thought I was. Checking off my Bible Study tasks from a list does not equal intimacy with Jesus. Surrounding my self with people I wanted to be like does not equal becoming the person God created me to be. I was finding my identity in all the wrong places. So, when He began to show me how much I was trying to control things, it was a very empty feeling. It was there that I began to discover that what I had with God was not nearly deep enough. God wanted all of me, not just the parts I needed help with. I can’t do any of it. I can’t make my body whole. I can’t control what other people think of me. And I certainly can’t satisfy my own soul. But it was through these years that God brought me to an understanding of something I never quite got before. I have said for as long as I can remember that I love Jesus. But as I was going through yet another Beth Moore study, God gave me a gem. The question, “Are you IN love with Me?” Do you hear it? Do you notice the subtle difference? I can’t wait to show you, in my next post, what He taught me about love when I started to listen. So, am I surrendered? Yes. Do I always live like I am surrendered? No. It is a constant battle, but each day I remind myself WHO is in control, I sit quietly in His presence – even if I only have 5 minutes, and I surrender my heart to Him, falling more in love with Him everyday. 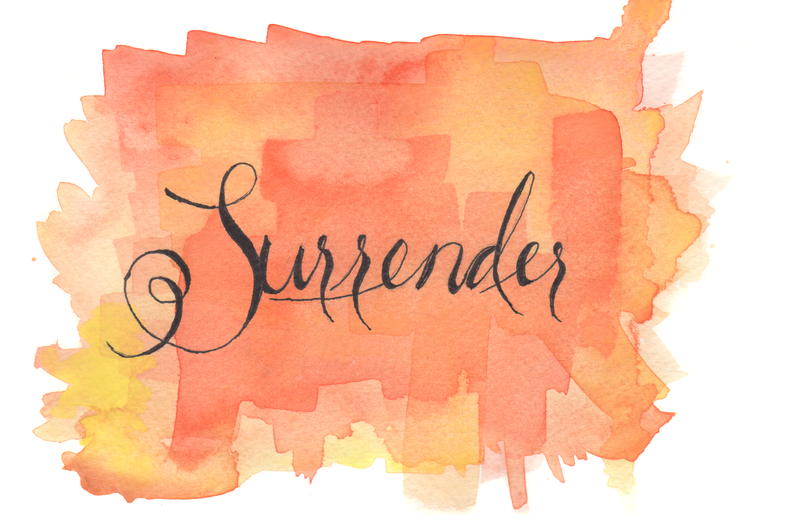 The more you practice the art of surrender the more you will realize where (and with Whom) the victory lies. Side note: The graphic above was created 100% by me, by hand. 🙂 I am pretty sure this is my first watercolor/hand-lettering combo EVER and probably my first time with watercolor since elementary school. 🙂 I am finding that mixing creativity with worship is such a sweet way to connect with Jesus. Soon, we will be creatively worshipping the Lord together in whatever way He has gifted you. And I will continue to share mine with you, as well. I am so proud to have such an amazing daughter!!!!!!! Perfect that my dad has posted my very first comment I have ever received as a blogger. 🙂 I love you, dad! Thanks for your support. It made my day! This was beautiful Terah! God has been speaking to me about identity and where I get my value from for years now & it has changed my life! Through tremendous loss, God showed me that my value never diminished and that HE alone is my source for everything. I too struggle to stay in that place where I believe all that God says I am, but I get back to that place as quick as possible. I can’t wait to read the next blog entry!!! It made me smile to read this! I am so happy to know about others who are learning some of the same lessons I am. It is so reaffirming!! Thanks for your testimony here and the encouragement it is to me to keep posting. Beautifully written… Honesty with God is sooooo important! I’m excited to see where He takes you on this adventure! Coming from a fellow writer, your comment has deeply encouraged me. Thanks for your excitement and support. It IS truly an adventure! !